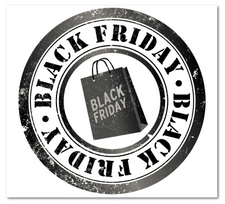 How domainers can take advantage of Black Friday. We’re about a week away from Black Friday and you can expect deals to start rolling out a day or two before that. Domain name registries and registrars have jumped on the Black Friday bandwagon in recent years by offering discounted domain names from Thanksgiving through Cyber Monday (the following Monday). Regardless, waiting until the day of a sale announcement to take advantage of these deals is futile. Instead, I recommend keeping a list of domains you’d register in each TLD if the price is right. That way you can jump on them when they are discounted. Keep in mind that almost all domain specials are for one year only. If you don’t think you’ll sell the domain within a year, factor in standard renewal prices. a new gtld dumping ground typically. Some .com renewal and transfer specials would be great, with no limits. Namecheap does 0.88 for new regs most popular gtlds, and 3.88 for transfers com/net/org https://www.namecheap.com/promotions/black-friday-cyber-monday-coupons/ 1 coupon per household though!